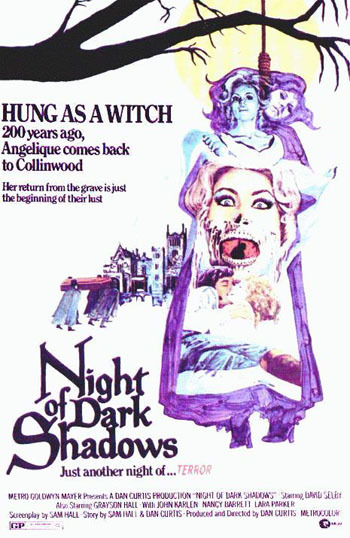 Since I reviewed House of Dark Shadows yesterday, it only makes sense to take a look at 1971’s Night of Dark Shadows today! While Night of Dark Shadows is not a direct sequel to the first film, it is still definitely a part of the same cinematic universe. There may not be any vampires in this film but it does take place in the same house and it features two members of the family that was decimated over the course of the previous film. At one point, it’s mentioned that Joan Bennett’s character from House of Dark Shadows died after the first film but no one goes into any details. I guess a vampire in the family is something that’s simply not discussed amongst polite company. Soon after everyone moves in, Quentin starts acting strangely. He becomes obsessed with the painting of a beautiful woman who was named Angelique (Lara Parker) and with the story that Angelique was hanged when it was discovered that she was having an affair with Quentin’s ancestor, Charles. (For his part, Charles was apparently walled up in the mansion. That sounds a bit extreme to me but I guess that’s the way they did things in the 19th century.) Quentin starts to have visions and nightmares involving his ancestor who, it turns out, looked exactly like him! Meanwhile, Carlotta and the groundskeeper, Gerard (Jim Storm), seem to be determined to make sure that Tracy doesn’t feel welcome in her new home. It’s almost as if they’re trying to drive everyone but Quentin away from the house. Night of Dark Shadows is a much more polished film than House of Dark Shadows but it also unfolds at a far more leisurely pace. It lacks the relentless energy that distinguished House of Dark Shadows. This wouldn’t be as much of a problem if the plot itself wasn’t so totally predictable. From the minute that Quentin first sees that portrait of Angelique, you know that he’s going to get possessed and start acting strangely. There are a few atmospheric scenes but, for the most part, the film just doesn’t grab the viewer’s attention the way that House of Dark Shadows did. On the plus side, David Selby is properly intense and brooding in the dual roles of Quentin and Charles Collins while Lara Parker does an equally good job as the wonderfully evil Angelique. Grayson Hall, who tended to go overboard in House of Dark Shadows, gives a much better and far more menacing performance here. Night of Dark Shadows isn’t a bad film. It’s just not a particularly memorable one.